The bike chain is what transfers your leg power to the wheels. It is a key component in the bike’s transmission and will keep your MTB moving. Although bike chains are relatively simple, they are essential for your mountain bike to function properly. Picking the Best Mountain Bike Chains can keep you safe when you are on a challenging trail. When your wheels move properly, you are going to be able to avoid obstacles and manage your MTB regardless of the nature of your mountain biking trail. Bike chains come in different shapes and sizes. They need to be reliable, sturdy and well-made. You don’t want your chain to break when you are already exploring rough terrains on your bike. This is why we wrote this buying guide to help you find and pick the best bike chains for your MTB. How to Choose the Best Mountain Bike Chains? In each bike chain review, you’ll find detailed information about one of the best-selling chains. We understand that picking the right accessories for your MTB is essential for your safety and to ensure that you will have fun. We know that people have different needs and this is why we wrote honest reviews including the pros and cons of each product. This sturdy bike chain is made of 116 links. It is compatible with various 9 speed systems to secure your ride regardless of the type of your MTB. This sturdy chain weighs less than 300 grams so you won’t feel its weight on your MTB. This is considered to be the best mountain bike chain 9 speed thanks to the double X bridge shape. This ensures fast and smooth shifting. The chain is mushroom riveted for extra strength and durability. This ensures that your bike chain will stretch properly and will last for long no matter how hard you abuse it on challenging trails. The outer plate of this MTB bike chain is nickel coated to resist corrosion and rust. It is chamfered and symmetrically cut to minimize tooth interference to guarantee reliable shifting every time you get on your bike. It also comes with a master link that you can snap into place without using any tools. An excellent bike chain that is compatible with most 9 speed systems. Sturdy construction made of 116 links. Mushroom riveted for extra stretch and durability. Nickel coating to resist corrosion and rust. Comes with a reliable master link that you snap into place without any special tools. Relatively loud compared to other chains. This is an excellent bicycle chain that is made of 116 strong links that won’t break or malfunction as you pedal your way through rough trails. It is specifically designed for Shimano Deore and Tiagra to ensure the best performance. In spite of its narrow construction, this bike chain is super durable and will not break or bend. It is the best 9 speed bike chain for a smooth and flawless ride. It comes with the pin that you would use to connect the ends of the chain together. It can also be shortened for maximum convenience. With this chain, you can guarantee that your bike will perform exceptionally. It is a reliable bike chain that you can depend on if you want to spend quality time on your MTB. It is well-built, properly made and will perform exactly as it should. Strong MTB bike made of 116 strong links. Compatible with Shimano Deore and Tiagra for the best performance. Durable construction for smooth performance. Comes with a pin to connect the ends of the chain. It can be rather stiff at the beginning. But some lube will make it smoother. Don’t be fooled by the affordable price of this speed chain. It is considered to be the strongest mtb chain since it is made with a special emphasis on strength and durability. It features chrome hardened pins that won’t break with regular use. This bike chain will improve the performance of your MTB regardless of the condition of the trail. The bulged outer plates makes the chain extra strong and long-lasting. When you buy this bike chain, you can rest assured that you won’t have to replace it for a very long time. It won’t break or bend as you move your pedals to enjoy your mountain biking adventure to the fullest. Whether you are at home or on the trail, you can quickly install this bike chain to replace the old one. It comes with a quick-connect power link for convenient installation without ever needing the help of an expert. It doesn’t show any signs of wear or stretch even when you use your MTB every day. Make every day memorable with this bike chain. Chrome hardened pins for extra strength. Bulged outer plates to ensure that the bike chain will last for long. Quick-connect power link for quick replacement and installation. Doesn’t wear or stretch with regular use. It is made of 114 links. So it might not be enough for a 29er. This MTB chain is made of steel that doesn’t bend or break with abusive performance. It is designed for heavy-duty riding on rough trails. Nevertheless, it features an elegant golden finish whichis extremely elegant and eye-catching. Install it on your bike, and you are going to enjoy a smooth and fast ride every single time in addition to an elegant bike that will turn heads. This mountain bike chainfeatures strong mushroom pins that prevent the excessive stretching that usually ruins your bike chain. The X shaped bridge ensures smooth shifting as you increase the speed. Now you can enjoy your ride, knowing that your bike chain is durable and reliable. It doesn’t have any sharp angles or edges which ensures a significant reduction in noise while shifting. The Titanium Nitride is what makes it eye-catching. It also improves the friction and guarantees that your bike chain will not wear or corrode with time. It comes with a pair of links for emergencies. The performance and durability of this chain are second to none. Golden Titanium Nitride coating to reduce friction and corrosion. Strong mushroom pins to prevent stretching. X-shaped bridge for smooth shifting. A pair of extra links. Some riders wished that the golden finish was a little bit brighter. How long is your bike chain going to last? This should be the first question to ask yourself when you are shopping for the best single speed bike chain. This chain is the best value for your money since it is extremely durable in spite of its affordable price. With 112 links, you can’t go wrong. It features an anti-drop design which is nickel plated to resist corrosion and rust. The design of this chain guarantees that it won’t break, bend or stretch when you are using it every single day. It is a versatile chain that you can use on your BMX or single speed bike. It comes in various colors that suit every model out there. It is guaranteed to keep your MTB moving the way you want for the best mountain biking time. It features a master link so you can adjust it the way you need. The black color features 96 links, so you have more than one option when it comes to picking the perfect chain for your bike. It is assembled properly, so you will need special tools to remove any extra links. However, once you install it, you are going to enjoy the best shifting and the most reliable performance. 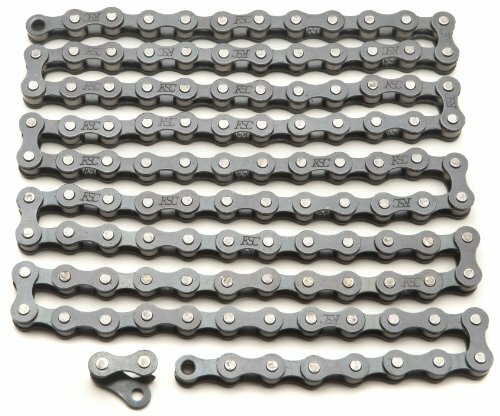 Durable single speed bike chain. Nickel plated to resist wear and corrosion. Various colors for different tastes. Comes with a master link. The master link is a bit wider than the others. 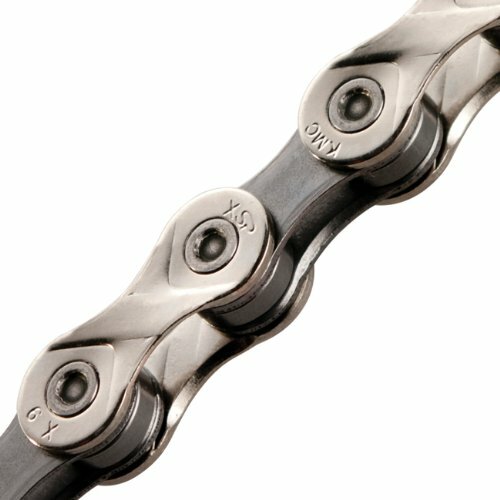 The combination of steel and nickel makes this bike chain one of its kind. The steel links are very sturdy and will handle a great deal of abuse before they start to show any signs of wear. This bike chain will not stretch which guarantees that it will keep on performing well, for a very long time. The nickel coating is applied to the inner and outer links to protect the bike chain from corrosion and wear. A lot of avid mountain bikers consider this to be the best mtb chain 10 speed as it is very durable with respect to its practical lightweight. It allows for smooth and reliable shifting as you maneuver different obstacles on your trail. It is also compatible with various systems with no tooth interference for quiet and smooth operation. This makes it a great option to consider when you think about replacing your bike chain. It comes with a power link that you can use in case of an emergency. It is as strong as any other link on your chain, so you can rest assured knowing that your MTB is always safe and ready to ride. This chain can be easily installed and replaced even when you are on the trail. Strong links made of steel. Doesn’t stretch with regular use. Nickel coating on the outer and inner links to protect from corrosion and wear. Lightweight with minimum tooth interference for smooth shifting. Power link that is reliable as any other link on your MTB chain. Installing the master link is somehow problematic. Every part of this bike chain is made of strong steel. This is the sturdiet and most reliable metal because it will not break or rust when you are using your MTB. It is compatible with most 10 speed bikes and is perfect for rough use. The stainless inner links are very well-made with minimum tooth interference. Every link is properly and perfectly cut to minimize friction. This means that your bike will be very quiet and will not disappoint you as you speed up while mountain biking. The bike chain is nickel coated. This lengthens the life of the bike chain and prevents rust and corrosion. It is lightweight, practical and extremely reliable. It can be easily removed and installed when you need to clean it. It also comes with a clip connector. Strong 10-speed bike chain for rough trails. Compatible with different 10 speed systems. Nickel coating to resist rust and corrosion. Relatively expensive compared to other bike chains on the market. This bike chain is made by one of the most reputable manufacturers in the world of mountain biking. It offers excellent quality at an unbeatable price for safe and reliable performance on different trails. This chain is shipped with the pins pre-installed and ready to be snapped into place. You can install the chain without a special tool if you want to have your MTB ready in no time. Even if you have an old bike, your chain is going to improve the performance impressively. It comes in 2 different sizes to fit 21 speed, 10 speed, and even single speed bikes. If it comes longer than needed, you can easily remove the extra links for the perfect fit. This bike chain doesn’t come with a master link but this doesn’t affect how durable it is. It is a reliable MTB chain for quiet and friction-free performance. If you need fast and hassle-free shifting then this is what you are looking for. It is also great value for the money. Pre-installed pins for easy use. Fast installation without needing any special tools. Fits different bikes for the best performance on any MTB trail. Doesn’t come with a master link. This budget-friendly single bike chain is what you need as you explore rough trails. It is sturdy, durable and will provide smooth performance. It is an excellent deal with 112 links to transform the motion from your pedals to the wheels. It is made of durable steel that won’t break or rust. It is the best bike chain for rough bikers who take mountain biking seriously. The outer links are black while the inner links are dark gray. This makes the link the perfect match for vintage bikes as it is very elegant and unique. This bike chain rolls smoothly across the gears for the best performance. It is the best chain for rough riding because it doesn’t stretch with everyday use. It comes with a master link for fast and easy fixes. You can install this bike on your own because it is very straightforward to use. You can also shorten it if you need to. Budget-friendly single speed bike chain. Steel links that don’t break or wear with daily use. Vintage style with black and gray links. Comes with a master link for emergency use. Can be installed with no special tools. It is rather noisy and needs regular lubing. Accurate shifting is what you need to enjoy your mountain biking time to the maximum. This is what you gain by installing this single speed bike chain to your MTB. It is compatible with single speed bikes to provide smooth shifting with no friction. The bike chain is very well built and sharply cut to reduce tooth interference. The bike chain is coated to minimize wear after regular use. It comes with a Snaplock connector to replace your old bike chain in no time. You can also lube it to guarantee a flawless performance. The rugged V riveted design is the best to endure rough conditions. The MTB chain doesn’t break or show any signs of wear as you ride it for long distances. This black chain is a great addition to your MTB. You can easily adjust the length to fit your bike. Just remove the extra links and install it back without wasting one more minute without enjoying your mountain bike. It is very quiet and smooth. 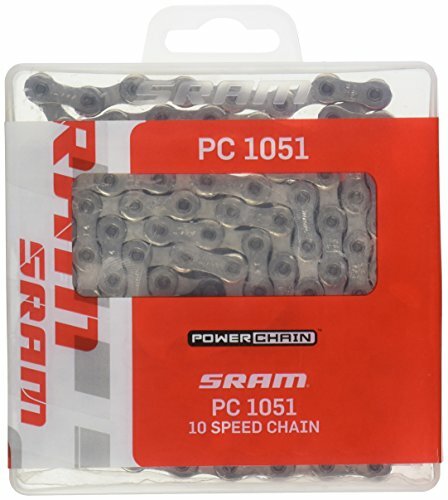 This is the most durable bike chain and is excellent value for the money. Compatible with single speed bikes. Smooth shifting with no friction. The connector link is hard to distinguish. The chain that you need to buy must be compatible with your bike. But with a number of available bike chains available on the market, choosing the perfect bike chain can be difficult. What is your mountain biking style? Are you looking for a chain for your BMX riding adventure? If you usually spend more time on rough trails or are interested in mountain biking stunts, then you need to make sure that you are investing in a sturdy chain that doesn’t break easily. Trail riding is less rough. You can get away with a less durable chain. The size of the chain that works on a single speed bike is different from the one that you use for your 9 speed MTB. The size refers to the width of the links of the chain, including the master link. 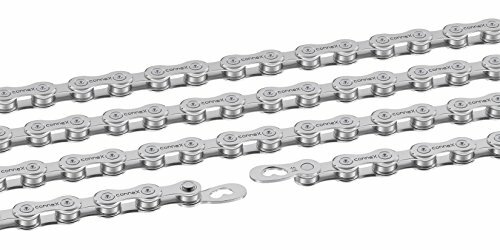 If you are riding a 9 speed MTB, you need a thinner chain than the one that you could use for your 11-speed bike. Otherwise, it won’t fit through the sprockets. The length of your bike depends on the number of speeds your bike is capable of. Single bike chains are better for beginners because they are simple to handle. Long range riding can make room for more speeds. The bigger your wheels the bigger the number of links you will need. Make sure that your bike chain can be easily shortened to fit your MTB. Some chains also come with extra links to make them longer. Most standard bike chains are made of alloy steel. This is durable and doesn’t break as you ride your bike on rough trails. It is also not expensive so you are going to break the bank while enjoying your MTB ride to the maximum. Nickel plated bike chains are more durable because they are wear and rust resistant. They also come in various colors to suit every taste. You don’t have to be an expert to replace or install chain your mountain bike. Make sure that the chain can be easily removed and comes with a reliable master link. This will allow you to easily and perfectly lube it. Regular cleaning and lubing protect your chain from stretching over time and maintains its condition for long. There are a lot of bike chains available on the market. You don’t have to be an expert to replace your chain for the best performance. Mountain bike chains are usually forgotten. You don’t really realize how important your chain is until it actually breaks. This is why you need to make sure that you are investing in an excellent chain. The Best Mountain Bike Chains will ensure that smooth and reliable shifting of your MTB with minimum friction. Make sure that you pick a reliable bike chain that won’t break or bend as you enjoy your mountain biking experience.